Thank you for the responses. I plan to pick out two healthy meals tonight, one lunch & one dinner, and get cooking. I am looking forward to allowing my taste buds to savor real food over the long term. I would like to either join an existing topic or start a new topic for we newbies who are struggling to learn this new way of life. Are you familiar with an existing topic thread? If not, I will start one, by jove! 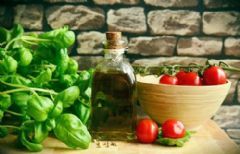 My name is Carol and I am researching the Mediterranean Diet, not as a diet, but as a new way to eat from this point forward. I hope to get to the grocery tomorrow night, so I have a lot of reading to do between now and then. I thought I would start out with a couple of lunch/dinner recipes and learn as I go. Are there staple items that you have found you can't live without? That you use all of the time? I already have a bunch of garlic because I love to cook with it. Do you purchase fresh herbs each week or do you go the cheaper route and purchase dried? If you use fresh, how do you keep them from wilting? I grocery shop at a co-op here in town but it's not in the most convenient location so frequent trips aren't in the cards for me. Between dog training and working for a living, I don't have much time for the grocery store, and to be honest, I HATE grocery shopping! Any and all tips will be welcome!! What Is Your Favorite Mediterranean Dish?